Plant Description: The Ginkgo tree, indigenous to central China, can reach a height of 40 meters, and live as long as 100 years. It is a highly adaptable plant and can grow in almost any temperate or Mediterranean climate. It prefers rich, sandy soil, and has one or several main trunks and spreading branches. The leaves are petiolate, glabrous and bilobed. The Japanese call this species “I-cho” meaning “tree with leaves like a duck’s foot”. Each lobe is triangular with fine, fan-like radiate veins. The leaves turn yellow in autumn. The female trees produce a fleshy fruit with an edible kernel if there is a male tree nearby. These have long been a source of food in Asia. As Ginkgo Biloba is resistant to pollution and pests, the male ginkgos are very popular in cities. Medicinal Properties & Uses: Ginkgo Biloba has become widely used as a dietary supplement for increasing cognitive functions in elderly people and delaying the progression of Alzheimer’s disease. A treatment period of 4-6 weeks has shown that Ginkgo alleviates symptoms associated with cognitive deficits such as decreased memory performance and alertness, and lack of concentration. It is effective in treating ringing in the ears (tinnitus), as well as asthma and depression. 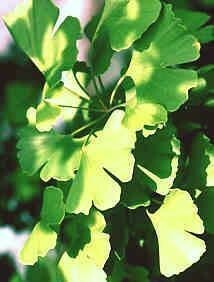 Additionally, Ginkgo has proved to help with blood circulation and increases blood flow to the legs.